See what it's like to travel in comfort and style. 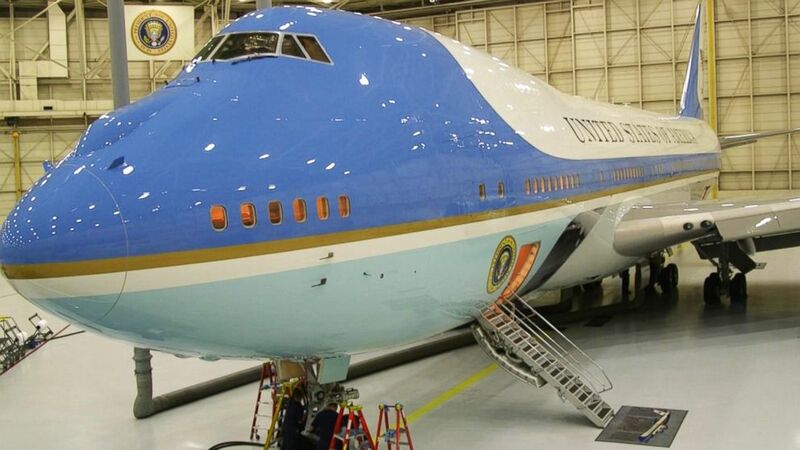 At first glance, Air Force One might look like a typical Boeing 747 with a customized paint job. But there's a lot more than initially meets the eye with the presidential plane, specially modified by the U.S. Air Force to operate as a fully functional and secure flying White House. (ABC News) Air Force One is pictured. The title of Air Force One implies that the plane is one of a kind. But, in fact, there are two identical planes. The planes are Boeing 747-200 models that have been specially-modified by the U.S. Air Force to meet the particular security and logistical needs of the president and his flying staff. 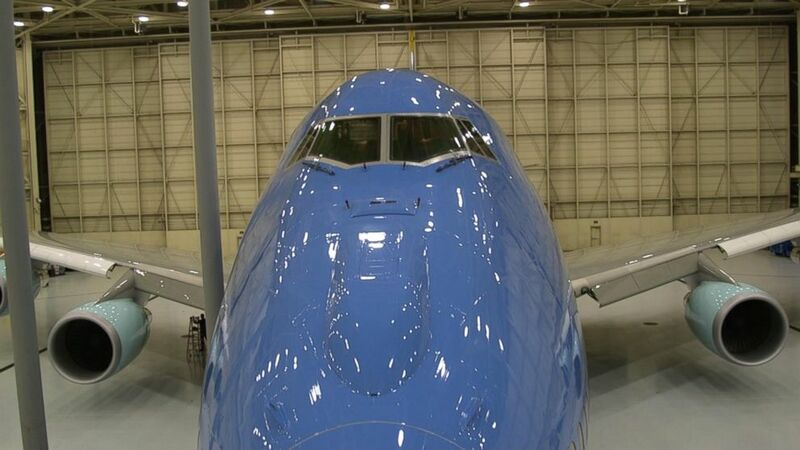 (ABC News) View of the in-flight refueling compartment on the nose of Air Force One. Who says you need to land to refuel a plane? Well, you don’t -- at least not if you’re the Commander-in-Chief. The presidential plane has the ability to refuel inflight, meaning it could stay airborne indefinitely. 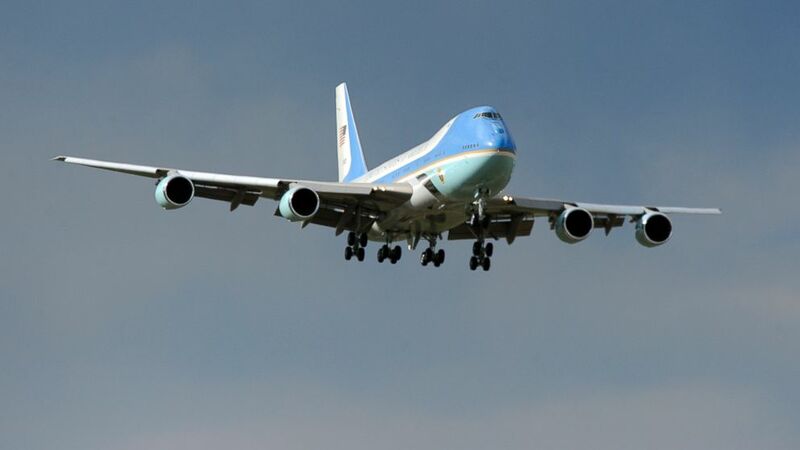 Though the feature would only be used in an emergency situation, Air Force One has special fuel cap on the nose of the plane to which a second Air Force plane could connect a gas pump of sorts, while cruising above the presidential plane. The fuel cap is well disguised on the nose of the plane by an artful paint job, which would be chipped should the feature ever need to be utilized. 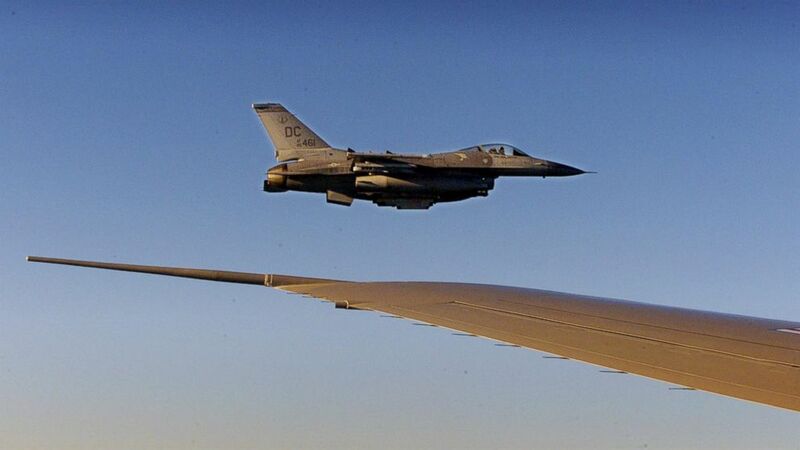 (Doug Mills/AFP/Getty Images) An F-16 fighter flies just off the wing of Air Force One on a flight back to Washington, Sept. 11, 2001. Air Force One has the ability to fly at a speed of over 600 miles per hour (or 92 percent of the speed of sound) -- so fast that F-16 fighter planes escorting the president’s plane while in flight on September 11 had difficulty keeping up and had to ask the plane’s pilot to slow down. Then-pilot Col. Mark Tillman later recalled that the plane was moving at almost supersonic speed. (Pete Souza/The White House) President Barack Obama talks on the phone with Israeli Prime Minister Benjamin Netanyahu aboard Air Force One en route to New Orleans, La., Nov. 8, 2013. Seated at right are Tony Blinken, Deputy National Security Advisor, and Trip Director Marvin Nicholson. The plane is equipped with an encrypted telecommunications system so that the president is never more than a secure phone call away. The Commander-in-Chief can securely pick up one of the plane’s 87 phones and talk to anyone in the world from the sky. Should there ever be an attack on the United States, the plane could function as an airborne command center with high-speed internet access and the ability to deliver a nationally televised address from its video-teleconference system. 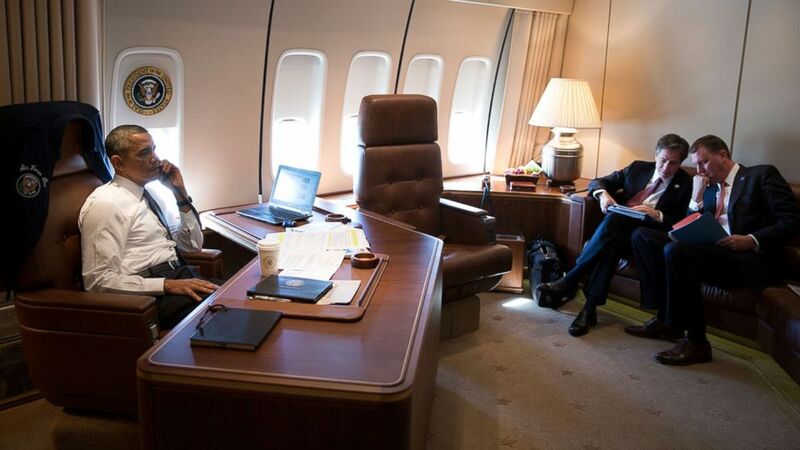 (Pete Souza/The White House) President Barack Obama talks with Ben Rhodes, Deputy National Security Advisor for Strategic Communications, aboard Air Force One en route to New York, N.Y., to commemorate the tenth anniversary of the 9/11 attacks against the United States, Sept. 11, 2011. The president and accompanying passengers enjoy 4,000 square feet of internal space onboard the plane across three decks. The spacious presidential quarters include a living area complete with beds, a private bathroom and shower, a Situation Room, and presidential office. The office is so spacious the president can use a mobile treadmill, kept in the cargo hold but brought up for exercise sessions during long-haul flights. There is also an onboard medical facility and two kitchen galleys. 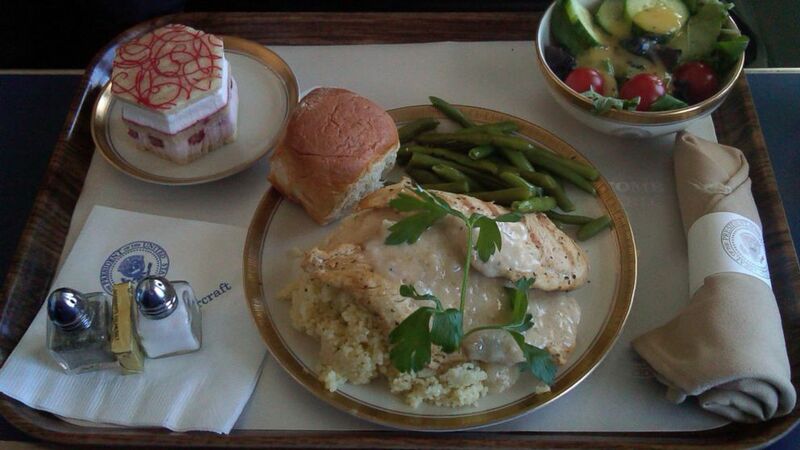 (ABC News) This photo shows a typical meal on Air Force One. These days you're lucky to get a bag of peanuts on the average commercial flight. But on Air Force One, the president, flying staff and traveling press are served by two kitchen galleys equipped to feed up to 100 people with carefully prepared food fit for a president. If the president doesn't like what's on the menu, staff keep a supply of groceries on hand to prepare whatever he’s craving. (Karl Gehring/The Denver Post via Getty Images) Air Force One made an approach from the north as it came in for a landing at Buckley Air Force Base, April 24, 2012. If it's not complicated enough that there is more than one Air Force One, there is also more than one name for the famous presidential jet. While "Air Force One" is the most commonly known name, its Air Force designation is VC-25A, and its classified call name is "Angel." 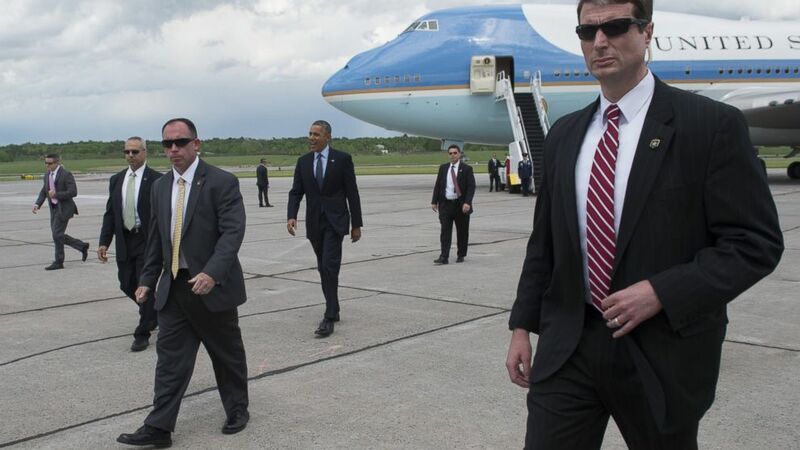 (Saul Loeb/AFP/Getty Images) President Barack Obama, surrounded by US Secret Service agents, walks to greet guests after arriving on Air Force One at Griffiss International Airport in Rome, New York on May 22, 2014. Though the details of the plane's defense capabilities are shrouded in secrecy, Air Force One is a military aircraft with the ability to function as a de facto bunker in the event of a nuclear attack and capable repelling airborne missiles should the plane ever come under attack while flying. The plane also has a special electronic defense system that can jam enemy radar. 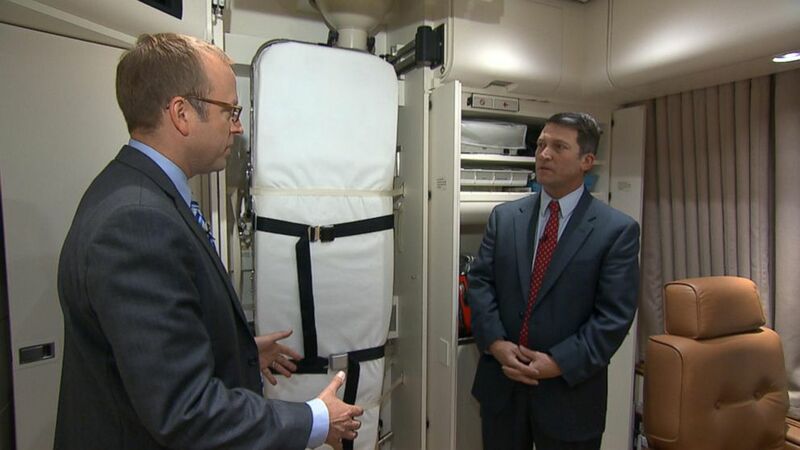 (ABC News) This photo shows the medical annex on Air Force One. Not only does a doctor travel with the president when he flies, but there’s a medical facility on Air Force One that is equipped top act as an operating room in the event of a life-threatening emergency. The facility includes a well-stocked pharmacy and medical tools, operating table and equipment, and for long trips overseas, also carries an extra reserve of the president’s blood type in a refrigerator in the medical annex. (Brendan Smialowski/AFP/Getty Images) US President Barack Obama's armored limo drives to Air Force One at Cleveland-Hopkins International Airport on March 18, 2015 in Cleveland, Ohio. Wherever the president travels, his specially-crafted limo, dubbed the "Beast," goes too. The presidential limo receives the Commander-in-Chief when he lands at his destination. 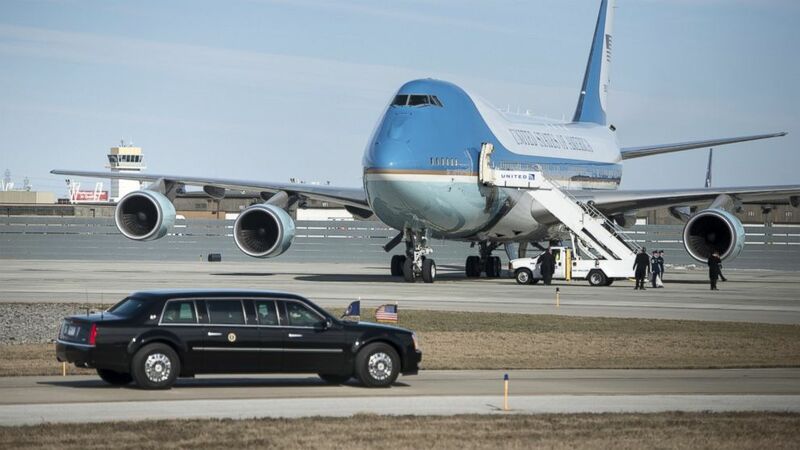 Accordingly, the American made Cadillac limo is sent ahead of the president in a military cargo plane so that it's in place on the proper tarmac when the president does arrive.